This chair was built by David A. Call, about 1820. It was one of a set of six. The chairs were made of hickory held together with square nails. Photo and story contributed by Leah Rudy, 1999. My status quo was not always what it is today. Once I occupied an important place in my creator's household. Although there were five others similar to me, no two of us were exactly alike. We were all rugged individuals; when I say rugged, at least, I can attest that, by my withstanding the ravages of time for I am close to one hundred and fifty years old. My five companions, to my knowledge, have long since been gone, although they too, lasted for many years. Always I have been the favored one as you shall learn. The man was young, as I first remember him. From the time that he made me and the five others, I was singled out for HIS chair. He must have planned it so, because my back was built somewhat higher than the others, probably because he was a tall man. I was hewn out of a stanch hickory tree, as "the other five". A broad ax shaped my destiny. My frame held together with square nails, is still sturdy. I now wear something which my creator's great granddaughter made for me and which she calls a slip cover, to hide my one defect. Thin slats of hickory, and resembling basket weaving, formed my seat for many years. Eventually these wore thin and dropped apart to fall away from me. As people grow old, I notice that they too, lose part of themselves such as teeth and hair. But age also has its recompense. It is rich in memories and experience. I have both for I have been here long and traveled some. The man to whom I owe my existence was named Call. On the outskirts of a little settlement in Southern Ohio, he built a log cabin to which he brought his young bride, Anne. I and the "five others" were there when lovely Anne, just seventeen, crossed the threshold of her new home. She exclaimed that the cabin was beautiful, and indeed, it did look inviting. David had built a cheery fire on the hearth to greet his young wife. To the windows, hung white cloth, greased, to make it somewhat transparent, thereby admitting more light. David Call was then, a poor man and could not afford glass window panes. What seemed to please Anne most, was the floor in the cabin. Many of the settlers had only dirt floors, but David was determined that his house should have a wooden one. He had planed the boards until they were quite smooth. The one and only room was big. In one corner stood a wooden bed stead, also hewn from a tree; black walnut, they said it was. A table, also staunchly made, stood in the center of the room and myself, of course, and the "five others." It was my privilege to be a casual observer in this new household. David was a deeply religious man, and each night, when the logs burned low in the fireplace, he knelt by my side to pray, after which, he immediately went to bed. He retired early and was up in the morning when the light showed first in the eastern sky. Candles were made from home-rendered tallow but used sparingly against a time when they might be more badly needed. Many tasks were accomplished by the light of the leaping flames in the fireplace. During the years that passed, four children, two boys, John and Alec and two girls, Julie and Anne, were born to David and Anne, to bless their union. As these children grew along with the years, I held each one many times, within my arms. One evening, David told his children the story of his childhood which was as strange as any I've ever heard. The family listened in breathless silence and small wonder, for he told them that when he had been a little boy of four years, a marauding band of Indians had stolen in as he played on the edge of the clearing around his parent's home, in the wilderness. He vividly remembered his terror, although the Indians did not harm him. But they guarded him to prevent any efforts to escape. The little boy cried for several nights and sometimes, through the day, for his family, especially for his mother. He was ignored until he grew hungry, at which time, a squaw brought him food. Very young things soon cease to grieve and before long, he thought, only, occasionally of his brother and sisters and parents. As time passed, the boy was regarded as one of the tribe. He had no desire to run away and would not have known which direction to take, if he had ever entertained such a thought. David was taught many useful things, then; the use of herbs for medicinal purposes. He was wise in wood lore and a good hunter. As the years passed and He grew older, he noticed the difference between his skin and that of the red men. He knew that he was not really one of them, so he grew anxious to find his own people. Fearing this, the Indians agreed to try to help him. Some of the older men lead him to the location from which they had taken him, sixteen years earlier. The country along the Ohio River was rapidly being settled and where once had stood a lonely dwelling, there was now a hamlet. After making some inquires, David found his brothers and sisters, who were all living and now of course, also, grown up. His parents had both passed away; his mothers death occurring about a year after David's disappearance. Some said that she had died of grief over the loss of her "baby." The young man had many things to learn: to talk as white men do; sleep in a house and work as they worked for he had been a free soul. For some years he was more of an Indian than a white man, after he returned to his people, but the transition gradually took place and several years later, David married. The story which he told his children explained many of his characteristics, for example; his stern and dignified mien. He had learned to cure some human ailments by the use of wild plants brewed into teas and extracts which the Indians used for medicinal purposes. Gradually, people learned of this and came to him for help and many times received it. When the children were born to him and Anne were grown, Anne died. Her death was impending for two years previous, but her illness was such that David could not help her and he grieved silently for a long time, possibly for the rest of his life. His daughters, Anne, named for her mother, and Julie remained spinsters and one son, Alec, remained at home with his father and sisters. John the older one, married Mathilda, a fine young woman, and they began their family. Tragedy came to our country in 1861, when the war between the states began, the issue over slavery was the cause. Both John and Alec were called into the Federal Army which was the Northern side, opposing slavery; the Confederacy was the Southern Side, fighting to uphold it. This left Julie and Anne to care for their father. Mathilda had John and Jack, the two boys in her and John's family, come over and move her father-in-law to her home. I went along, too, as David refused to be moved, unless I was also. Mathilda worried that the care of their father was too much for Anne and Julie, as neither of the sisters was in good health. As David grew older he was quite demanding. It was sometimes difficult for him to move around. A two-wheeled pony cart was made for him and it became a duty for the two older grandsons to draw the cart almost every day, weather permitting, to take grandpa for his ride. Of course, I did not actually see this, but heard that if the boys did not step as lively as Grandpa wished, he carried a willow branch to give them a right smart flick of the switch. When the war was over, John returned home again, after an absence of four years. Isaac was not so fortunate, he was killed in battle. John learned that his sisters, Anne and Julie had died during the dread Typhoid fever epidemic; David had outlived three of his children. He still knelt by my side each night to pray, even though it was very hard for him to get up and down. But with John and Mathilda's family of seven, there was always some one to help the aging man. David held a place of respect in the home. Then at the age of ninety-three, he slept quietly away one night. Oh, my how I miss him. I remained for many years in this household. In fact, long after the children were grown, left home and went their separate ways. I always held an honored place in the parlor as long as John and Mathilda lived. But soon after their demise, the house and the land were sold. I was relegated to the woodshed to collect dust and mold. No one cares about an old chair. I was a "has-been" and just didn't harmonize with the factory made furniture of that era. My legs were straight while those of the new style all had bulges and curves. The backs of the chairs were carved with scrolls, garlands, cupids----anything the designer fancied. Perhaps you can realize how outmoded I was. I had been literally thrown out of the house! Then, out of the West one day, came a woman of resolution. She was my creator's granddaughter and interested in my welfare. What had become of Grandfather's favorite chair, also the "other five?" We were historic. Let those who wanted their modern furniture have it, but Katie wanted me. She seemed to be the only one who did. She tried, but with no success, to locate the "other five". I was discovered in the woodshed. Katie had me gently put into a crate with padding around my legs and back. After which a lid was nailed on the box and I made a trip by train out to Illinois. In the home of Katie and Jim, and their two daughters, I stayed for many years. The family traveled a lot for Jim was a nomad, by nature, and was never content to remain long in one place. But always, I went along, too, carefully padded and crated. My last move was out to Washington State, where I've been for the past seventy-six years. Mellow candlelight has shown upon me; I've felt the soft glow from a kerosene lamp, experienced the white glare of a gas chandelier and now the light from an electric fixture shines down on me. Right now, I'm in the home of a great-granddaughter of David Call's, but she, too, is very old. Perhaps one of her children will give me a home. If not, possibly a museum will want me. Considering my age, my frame is as strong as when David made me. Right now I feel I'm interminable. Rose Behrle was the daughter of Katie, David Call's granddaughter who came to Ohio and took the chair west. 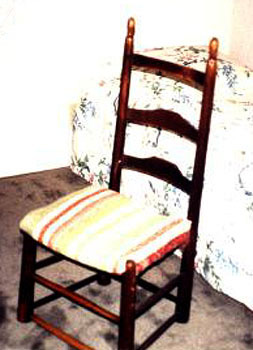 Thanks to Rose's daughter, Frances Frederick, (therefore the great-great-granddaughter of David Call) who has given permission to use the photo and story of "Great-Grandfather's Chair." Also thanks to Leah Rudy of Lisbon, Ohio for contributing these items.